There is an arresting visual moment in “Prisoners” when we literally see the gray raindrops that have been present essentially since the film’s grave inciting incident begin transform into wet snowflakes, fall giving way to winter right before our very eyes. It is not unlike an earlier moment when this thriller’s already unhinged premise seems to transform into something so sensationalist it jumps the shark. It would be nice if film could simply exist in a vacuum I suppose, but the recurring real world situation that kept populating my mind was Cleveland and the abduction of those three girls and the unspeakable horrors inflicted upon them. How can we know what anyone is truly capable of and what terror unknowingly lurks behind every door? This is the unsettling truth “Prisoners” grasps and throttles – for better or for worse – home. A pair of families gather for Thanksgiving. All seems normal until the youngest daughter of each family suddenly goes missing. 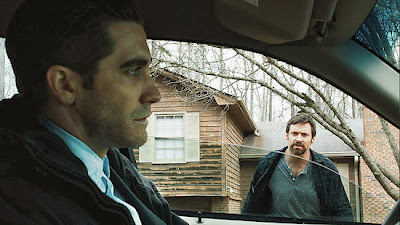 When they do, the rain begins to pour and Detective Loki (Jake Gyllenhaal), who has never not solved a case, shows up. Speculation on an abductor centers around a musty motor home where the two young girls were seen playing. The motor home belongs to Alex (Paul Dano), whose glasses, hair and complexion are like Thriller Suspect 101. Alas, Alex, possessing an IQ of 10, can hardly mumble a sentence. After the requisite holding period he is released and returns home with his Aunt (Melissa Leo). 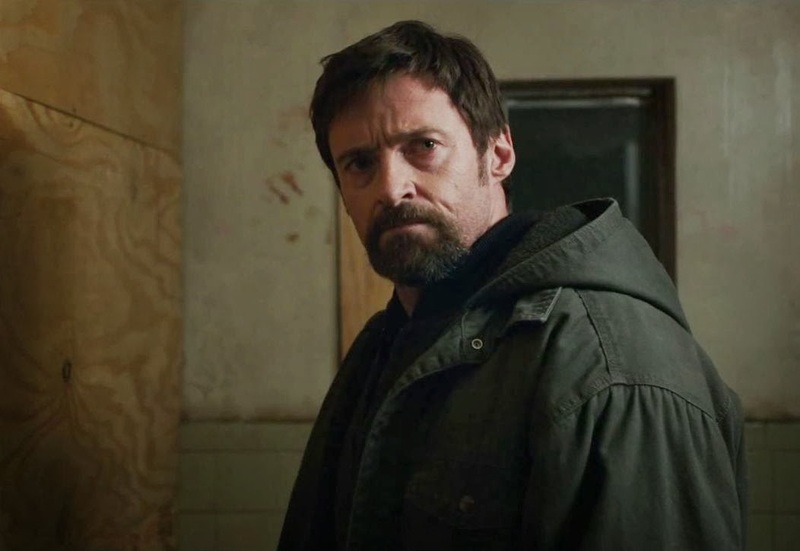 Loki has his doubts about Alex’s innocence and so does Keller Dover (Hugh Jackman), the blue collar father of the younger of the two missing girls. Convinced Alex is responsible for the abduction and maddened by what he views as police inaction, Keller acts by abducting Alex, locking him up in an abandoned house and relentlessly torturing him in an effort to unearth the truth. This is not a spoiler if you have seen the preview nor is it really a spoiler if you haven’t, for this “twist” occurs fairly early and “Prisoners” is – to quote its own metaphor – a maze that far exceeds any single reveal. The film, in fact, is a good two-and-a-half hours. Overlong? It is, but I dare say director Denis Villeneuve’s intention is to actively impress upon us that length – just when we feel the road to whodunit? straightening out, we hit another curve. “Prisoners” is the sort of the film that allows quality actors to delve deeply into the finer points of characterization. Jackman turns a sickly shade of pale and purposely plays at one note – thunderous. Gyllenhaal outfits his character with twitchy eyes, blinking repeatedly and rapidly in such a way that suggests they have been made to see more than they can believe (and says as much if not more than the stock introductory scene of his Thanksgiving dinner at a Chinese restaurant). So too does he come equipped with the teensiest tattoo of a cross on his thumb which plays directly off Keller’s own fascination with faith – the cross dangling around his neck and from his rearview mirror. Faith hangs over the whole film like its low skies, often fairly insistently, but often people of faith are very insistent in theirs. Gyllenhaal and Jackman are, of course, not alone in the cast, joined by the adept Viola Davis as well as Terrence Howard – both of which comprise the couple of the second missing girl – and Maria Bello as Keller’s wife. Skilled as this trio is, they are primarily – interestingly (curiously?) – relegated to the sideline. Bello spends most of the movie zonked out on sleeping pills. Howard (sporting an excellent homage to the Cosby Sweater in his first scene) and Davis are meant to function as the conscience to Keller, but his conscience seems of little consequence and so they are more or less moved aside. The push and pull of Keller and Loki is the movie’s center. The ethics at play in “Prisoners” are not convenient, and for that reason it is able to rise above its genre restrictions and requisite red herrings (particularly in the frustrating form of one character that just gets dropped in to distract the narrative). Ultimately its most fascinating theme is that of Keller’s absolutism. Faith, let’s face it, can be just as frightening as reassuring, and there is underlying commentary here about the modern day misappropriation of faith – I’m Right/You’re Wrong/No In Between. That is what makes the end a puzzle. It's less ambiguous, I would argue, than a choose-your-own adventure, a modern-day Lady or the Tiger? Villeneuve is saying the question of what happens after the final cut is one not to be lightly considered, and not for him to presume to set himself up as the one person able to answer it. And so he leaves it with all of us: should one be made to pay for their sins or be left to wrestle with them in their own mind? ooooh i love films that question your morals. Oh man, I LOVE what you said about the ending. I honestly hadn't even thought about it that way, and I've been thinking about it a lot. Perfectly said. I liked this a bit more than you, but that's all good. Either way, glad we can agree it's a smart thriller. And Gyllenhaal... whatta beast. Candice: Then this one was made for you. Go see! I don't think you'll be disappointed. Alex: Thanks, man. That ending........really gave me so much to chew on. My initial reaction was that it was copping out just a little bit by not taking its own stance, but I think I've come around more to what Villeneuve was driving at.